Boilers from Stafford Mechanical Services, Inc.
Do you need a full-service boiler contractor for your residence? Then you should know you can count on Stafford Mechanical Services, Inc. Stafford is pleased to provide customers with the best boiler products and services available. When you choose us, we’ll offer you quality boiler products from leading manufacturers, installed for you by our licensed and trained technicians. We work hard to keep our customers happy, and strive toward your complete satisfaction on every job we do for you. Choose Stafford for the best boilers and boiler services available. Boiler Maintenance: One of the best ways you can ensure the boiler in your home will run effectively and efficiently, year after year, is by making sure it’s properly maintained. When you work with Stafford Mechanical Services, Inc., you can count on us to provide the boiler maintenance you need to ensure the best possible comfort for you and your family, now and for years to come. Boiler Repair: Nobody wants to deal with a boiler failure, especially when winter is at its chilliest. Although a boiler breakdown is unfortunate, when you choose Stafford Mechanical Services, Inc. to help you, you can rely on prompt, effective boiler repair services. We are pleased to offer our customers 24/7 emergency repair services, so you and your family will be back to comfort quickly, no matter what the weather. Boiler Installation: When it’s time to install a new boiler in your home, you need a qualified boiler contractor to help you choose the best possible boiler available. What’s more, you need them to provide you with expert boiler installation and service after the sale. When you work with Stafford Mechanical Services, Inc., you can trust us to meet all your boiler needs, including professional boiler installation. For all the boiler needs of your home, you can count on Stafford Mechanical Services, Inc. to help you. 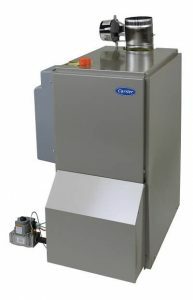 We proudly service Carrier heating products as well as any other brand. You may contact us via phone at (860) 684-9485. We look forward to helping you with all of your boiler needs.